Hannah Genders suggests some must-do jobs for the month ahead. A lot of people say to me that they don’t like February – it is their least favourite month – but I must say I have to disagree. It is the end of the winter and the start of spring, when there are a few things to catch up on in the garden before the frantic work of March and April really begins. The days are really starting to get longer in February and the light changes very slightly towards the end of the month from the “dying” light of winter to a “growing” light of spring. Make sure you go through the catalogues and order your vegetable and flower seeds ready for the season ahead to get the best choice. 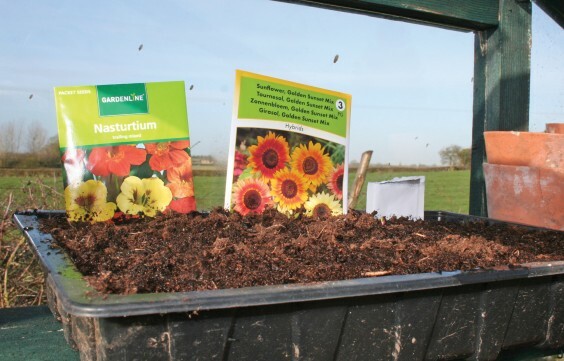 You can also start off some seeds, both flowers and vegetables, in the greenhouse or on a sunny windowsill this month. I like to grow edible flowers along with my salad crops so plant up a few seed trays to get them going and then plant out. There are a few crops that can be sown directly into the ground in February: broad beans are one, and by doing an early planting you can get an earlier crop which often misses the blackfly problems of late June. A cloche or some fleece over the young plants is a good idea if the weather suddenly has a cold snap. I’ve also planted onions from bulbs and garlic in February; as long as the ground isn’t waterlogged they come on fine. There is some pruning to be done in February. Autumn fruiting raspberries need to be cut down to ground level; this differs from the summer fruiting ones so make sure you know which you’ve got. Cut the stems to a few inches above the ground and mulch around the plant with some well rotted compost or manure. Gooseberries can also be pruned now if you haven’t done it earlier in the autumn. The overall aim is to clear out the middle of the plant and allow air to move through the centre. Do this by taking back the leader so the side branches shoot outwards, then trim the side branches back by about one third. This will encourage the fruit to develop and help avoid blight and fungal diseases through better air movement. I would also mulch the gooseberries once pruned and any other soft fruit you have in the garden. Rhubarb, which will just be shooting through now, can be covered with an old bucket or chimney pot to cut out the light, this “forces” the new shoots making them paler in colour and sweeter to eat. A good tip for this idea is not to do it every year as it weakens the plant. The best seed potatoes are available early in the season from any good nursery or garden centre, and if you get in early you will have the most choice of what to grow. Choose the varieties you would like and then get them “chitting” – this is where you stand them indoors with the eyes facing upwards to allow them to sprout before putting them in the ground next month; it just sort of gives them a kick start. Most shrubs are pruned in the autumn, but there are a couple of exceptions that like to be pruned now. One is the Lavatera or mallow; this is a pink flowering shrub that can often become overgrown and woody. This month, cut all the stems to about 30cm above ground level, and if there are any weak stems that are easily broken remove these completely to ground level. The result will be many more flowers and bright green foliage during the summer. Buddleia, or butterfly bush, can also be pruned at the end of February and into early March. This is another shrub that gets leggy, so cut the stems down to about 45cm above ground level and thin out any diseased or weak branches. Last but by no means least, this is an ideal month to have a good tidy up in the herbaceous border. Remove any dead flower heads, weed between plant clumps and give the whole bed a 10cm mulch of well rotted compost or manure. Some care now will result in a much better show of flowers from spring onwards and a bit less work when everything else in the garden takes over.